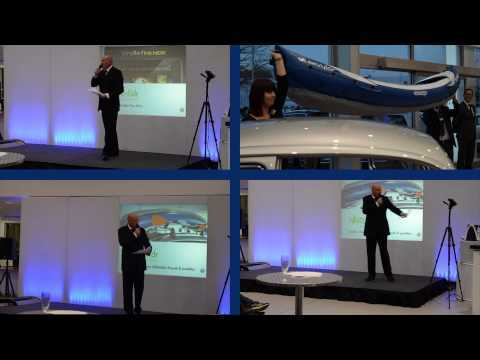 To celebrate the launch of their newly designed dealership, the St Albans team hosted 110 customers at a launch event evening on April 23rd. With such ample space, the showroom included both a kitchen, with celebrity chef Nigel Smith preparing dishes live for customers to enjoy, and a race track – with a giant scalextrics ready to race! The generous crowd also heard from Whizz-Kidz Ambassador Ruth Madeley, before raising a fabulous £1,500 for the charity through an auction. The Hertfordshire dealership spent five months – from October until February – undergoing a complete transformation, and Alex O’Donnell, Brand Manager at St Albans Volkswagen is as proud of how his team managed throughout the refurbishment process as he is of the new site. The refurbishment has seen a complete internal upgrade to Volkswagen’s latest standards, which included redesigning the entire showroom, reception and front of house, and aftersales. Externally the building was upgraded with new signage and entrance portals, a new car park layout was created and additional parking spaces generated. The improvements have meant the internal new car display has increased to at least 18 vehicles with up six used cars on display too. Externally, a used car display for up to 45 vehicles has been created. To contact our dealership, please find all of the information here. Lancaster Volkswagen St Albans look forward to welcoming you to the new showroom soon.